NeoLoad is a Load Testing and Stress Tool for Web Applications. By simulating a large number of users accessing your application, NeoLoad tests the robustness and the performance of the server under different loads. A clear and comprehensive test report pinpoints errors and bottlenecks. Through the test, NeoLoad answers these questions: - How many users does my site handle? - Will my site crash under load? - What are the response times? When high-end products are too expensive, when cheap and open source products are too limited, use the best mid-range tool: NeoLoad. User friendly and very easy to use (no scripting, wizards), it requires no training. Additionally, it allows you to design advanced scenarios to handle real world applications. NeoLoad tests your application, no matter how complex it is. For example, it dynamically extracts links and data while the test is running to inject them in the scenario. 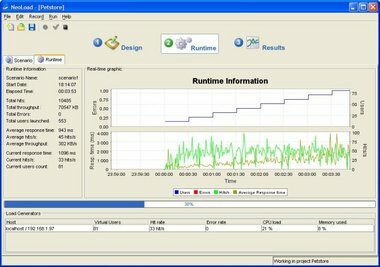 Key features: - Browser based recorder: Simply browse your application to record your scenario - System Monitoring: Get statistics from your servers (CPU, Memory, ?) on Windows, Linux, Solaris, SNMP devices, Apache, RSTAT, Oracle, Tomcat - Data replacement: Log in the virtual users with different accounts, submit forms changing the values - SOAP and Webservices dedicated scenario design - Advanced scenario: using logical actions: if..then...else, while... - Data extraction: Extract generated links and forms - Content validation: Check page content under load - Reporting: Generate a test report (HTML/Word/PDF/XML) - SSL: Record and replay secured pages. - IP Spoofing: Mandatory to test IP based load balancers NeoLoad is multi-platform (Windows, Linux, Solaris) and can generate a large amount of traffic by using additional load generators.